Senator Trillanes is about to meet with Duterte legal counsel Atty. Salvador Panelo at 11:00 AM in BPI Julia Vargas in Ortigas, Pasig [Inquirer]. Assuming that Trillanes will bring a sworn affidavit, Panel will finally allow Trillanes and by extension, a public, a peek into his much-debated-upon bank accounts. Thinking Pinoy can see five (5) possible scenarios. TP has discussed the first 4 in #BangkoSerye: 5 Scenarios in Monday's BPI Julia Vargas Meet (Part 1 of 2) and here’s the second part, where I promised to discuss the most exciting scenario, Scenario 5. Looking at the left-most table, you can see transactions 1 to 8, 11 to 14, and 16 to 23, have identical amounts and were performed pretty much on the same days. This theme recurs across all the three tables. Now, Trillanes’ original spreadsheet, furnished to the Inquirer at 2:27AM of April 27th, does not distinguish debit from credit transactions [Inquirer]. He revised this list later at 12:19PM of April 29th to claim that all transactions are inbound [Inquirer]. Was the exclusion of a credit-debit column an honest mistake? Was its inclusion 2 days later a deliberate afterthought? Credit-debit information is crucial, so was that information missing in the first place? Did Trillanes’ source provide crucial information or did Trillanes just assume all transactions are credits to avoid embarrassment? We will know the answer later in BPI Julia Vargas. NOTE: Transactions 33 to 36 were done on 20 October 2011 and not on 20 November 2011. It can be observed that the amounts ₱16,852,782.94; ₱16,852,832.94; ₱41,721,035.62; and ₱55,131,747.32 appear in different years on the same account. What is the likelihood that these deposits, made on just 6 dates spanning 4 years, match each other up to the last centavo? 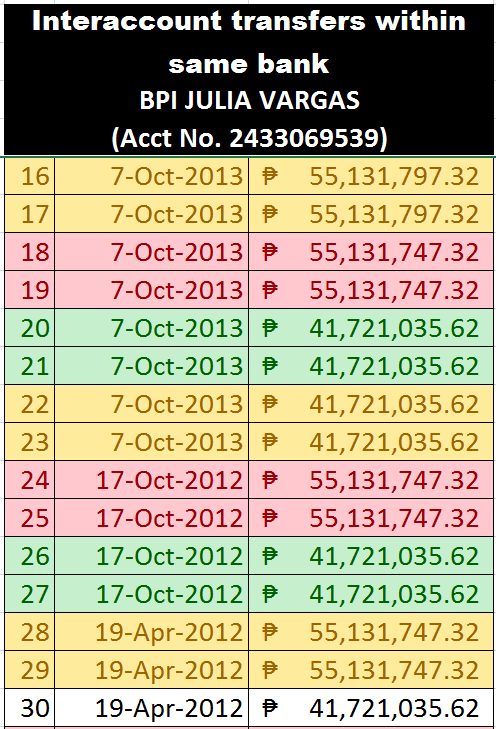 Does Duterte tell his cronies, “Okay, bayaran mo ako ng exactly ₱41,721,035.62 on these dates for four years. EXACTLY ha!”? What is the wisdom behind depositing the exact multi-million pesos amount on the same dates? The anti-money laundering law requires banks to report all transactions – even intra-bank transactions – that exceed P 500,000. Why bother to split the amount into 4 tranches if he’ll deposit it on the same day and he’ll be reported to AMLC anyway? Why didn’t he split it into batches of P499,999 instead? 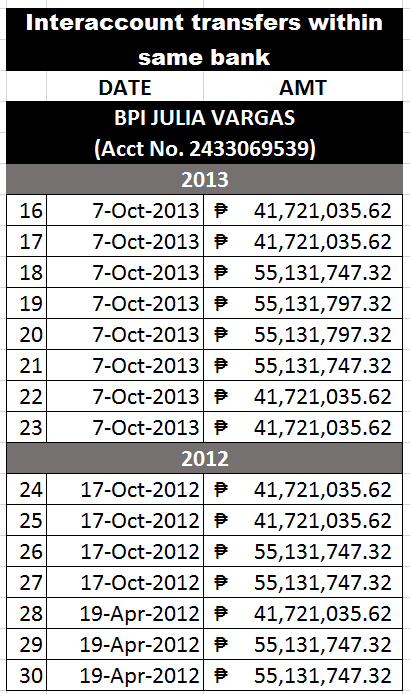 Aside from the sheer inconvenience of processing 4 transactions, four 7 Oct 2013 transactions would also trigger 4 AMLC reports instead of just one. So why? This kind of transaction pattern requires a great deal of stupidity to perform. Duterte is a lawyer. His daughter, Sara, is a lawyer. Sara’s husband is also a lawyer. They also come from a political family (Rody's dad is former Davao Governor) so they are clueless about corruption. Assuming that the Duterte’s are not stupid, which is not too much to ask, it appears that whoever framed the Duterte family did not plan this scheme very well: they forgot to mix up the figures and reused the same “kodigo” over and over. Were the culprits in a rush? Besides, even if the Dutertes were not very smart, why would they use an account that’s under their names? They could have used, say, Duterte Secretary Bong Go’s name instead. It just doesn’t add up. It's not logical. Oddity 1 and Oddity 2 gives rise to the suspicion that this is fabricated. Of course, we cannot be certain, that why we need to learn one important thing: the real directions of each transaction. Let TP explain why each transaction’s direction crucial. But first, let’s define a term. ThinkingPinoy defines a “zero-sum transaction pair (ZTP)” as two transactions involving the same account that are equal in amount, with one transaction being inbound (deposit or inbound transfer) and another outbound (withdrawal or outward transfer), and both were consummated on the same day. To state the ZTP concept more simply, a ZTP is a pair of same-day transactions, done on the same day, that cancel each other out. That is, each pair of transactions cancel each other out. It's also worthy to note that Transactions 5 and 8, while technically not ZTPs, differ by just P50. These ZTPs require a great deal of stupidity to perform because they make little sense in real life, even for actual money launderers. For example, Duterte allegedly deposited 20 million but he withdrew right away. Why would he risk a massive AMLC investigation, aside from the fact that it’s a total waste of time? 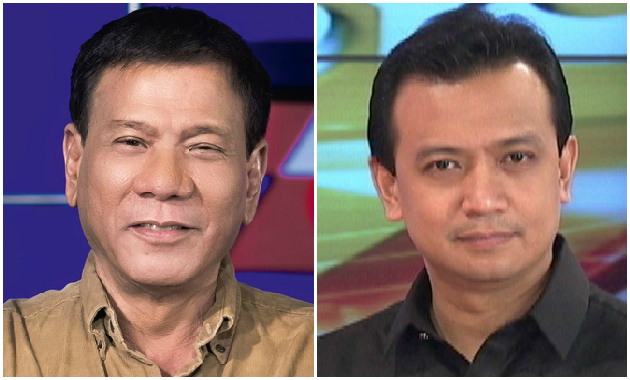 Duterte may not be the smartest among the five presidentiables, but he certainly isn’t stupid. Transactions 5 and 15 cancel each other. Transactions 10 and 30 cancel each other. For 2014: If 15 and 10 are credits and 9 is debit, end-of-year balance, to be reported in SALN, would be P 3,442,121.24, which is well below the P13.8 million declared in his 2014 SALN. Remember that Trillanes' original allegation was that Duterte under-declared in his 2014 SALN, and the ZTP theory can debunk that claim. 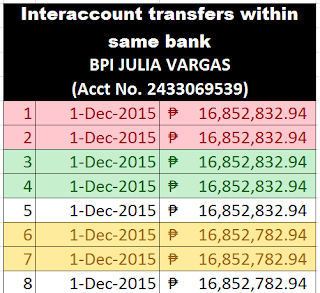 Unless Duterte runs some twisted kind of black-market money transfer service, these ZTPs do not make sense. 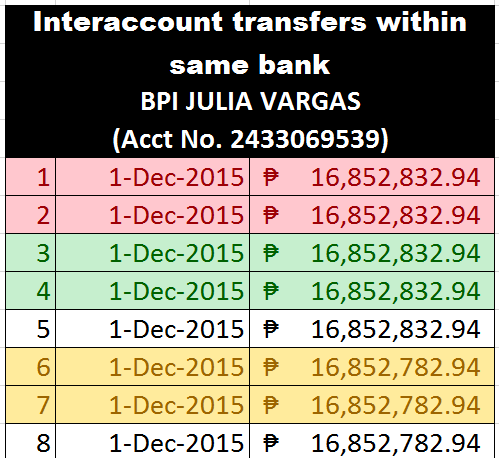 For example, Sarah can deposit 20 million in cash in BPI Julia Vargas then Rody withdraws the same amount later in BPI Downtown Davao. But with that kind of amount and factoring in the presence of AMLC, wouldn’t it have been wiser to just charter a plane and let someone hand it over to Rody in person? Again, Duterte may not be the smartest among the five presidentiables, but he certainly isn’t stupid. One glaring fact that hovers over this entire brouhaha is the absence of any Anti-money Laundering Council (AMLC) investigation. The Government is as inutile as [Mar Roxas], enabling Duterte to evade their radar for years. The Government provides Duterte special treatment by pressuring AMLC to shut up. BPI conspired with Duterte to launder money so BPI didn’t report transactions. These transactions were encoded just recently, implying a frameup job. First, Daang Matuwid, one of the accusers, will deny (1), as that would shatter the LP’s presidential campaign, so let’s consider (2). Second, Roxas and Duterte’s rift started in early Q4 2015 with Philip Lustre’s cancer rumors and it peaked in mid-December 2015 via the you-did-not-graduate-from-Wharton word war [TP:Wharton]. In short, they hated each other’s guts even before 2015 ended. Now, banks report suspicious transactions at the end of each month, so that AMLC should have received information about the December 1 multi-million transactions by January 2nd. With Roxas’ burning hatred for Duterte, along with the need to improve the former’s dismal survey ratings, this information would’v destroyed Duterte even before we got to celebrate the Chinese New Year. In short, (2) cannot happen, so let’s consider (3). Third, BPI will never admit to skirting money laundering laws as that would be the downfall not only of BPI but its majority owner, the Ayala Corporation. That is, if BPI indeed conspired with Duterte, it will delete all traces of the transactions even before we got to this point. Moreover, the total amount involved in this account – roughly P700 million over 5 years – translates to just P140 million a year. Seriously, the Ayalas are not that cheap, so (3) cannot happen. Fourth, we are left with (4): someone framed the Dutertes by encoding the transactions. But how can this be done? It’s quite easy: we just need a few BPI employees who have access to BPI’s system and insert back-dated transactions. Let TP give you an example. Suppose today is 20 April 2016. BPI employee X logs onto BPI’s account management system, enters the fake transactions and back-dates them. Of course, this will be a problem if Duterte discovers lots of money in his account, money that he didn’t deposit in the first place. There will be trouble if he somehow decides to withdraw the money or report it to management. That will trigger an internal investigation that will spell the end of Employee X’s career, so Employee X needs to create ZTPs to keep the BPI ledgers balanced. This is the same reason why many multi-million transactions in the Trillanes’ table come in pairs. One is debit, one is credit, so that at the end of the day, the total is zero, enabling Employee X to evade BPI’s auditors. This explains Oddity 1, or why pairs of transactions with identical amounts appear on the same day. One is credit (positive) and one is debit (negative), thus cancelling each other out. This also explains Oddity 2, or why there are identical amounts showing up in different years. More likely than not, Employee X did not remember to use different mounts to make the frameup more believable. 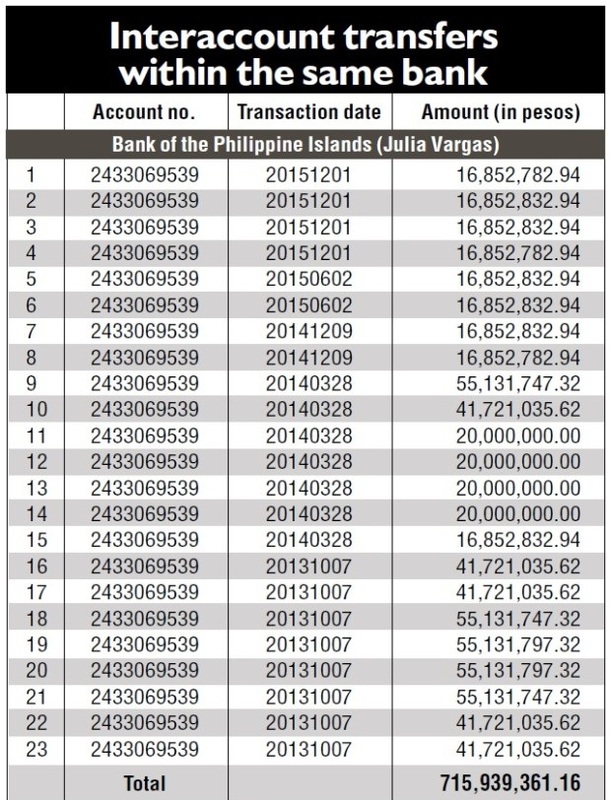 This also explains why the Inquirer's table (see below), who arrangement of entries is presumably based on a hard copy that Trillanes provided, mixes up the account numbers, as this can somehow confuse the public, making it difficult for us to discover absurd transactions patterns. I believe that BPI must have performed a comprehensive audit of Duterte's accounts following the April 27 expose. 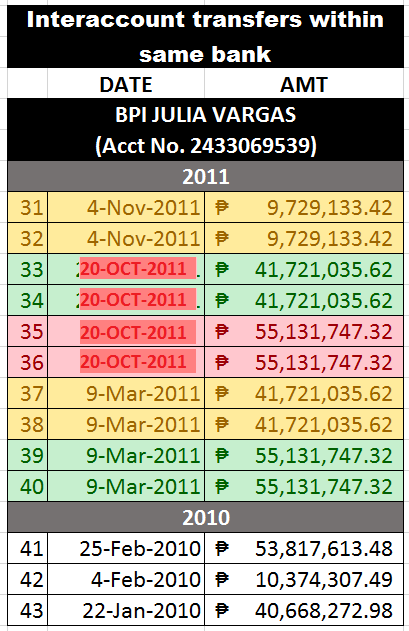 If this indeed is frame-up, BPI, at this point, would've already cleaned the records to remove fake transactions. That is, we may never even reach Scenario 5, i.e. 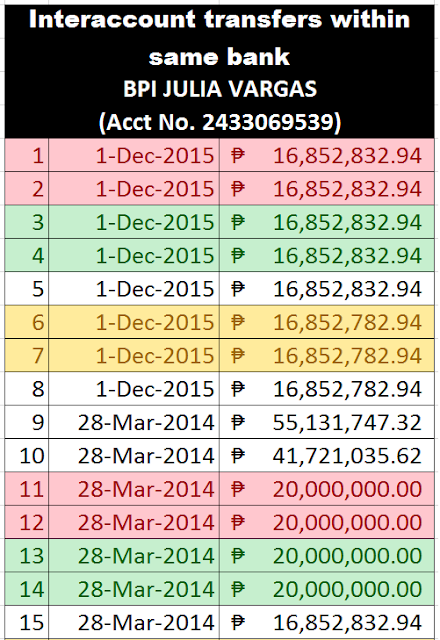 if BPI has corrected Duterte's bank records, Scenario 5 will turn into Scenario 1. Most of the transactions listed by Trillanes must be ZTPs, or transactions that cancel each other.